Living room: With wood burner and 42’’ Smart TV. Kitchen/dining room: With electric oven, ceramic hob, microwave, fridge/freezer, dishwasher, washing machine and wooden floor. Bedroom 1: With kingsize bed, 32’’ TV and en-suite with walk-in shower and toilet. Bathroom: With shower over corner bath, toilet and heated towel rail. . Oil central heating, electricity, bed linen, towels, Wi-Fi and logs for wood burner included. Travel cot and highchair available on request. Welcome pack. . Large lawned garden with patio and garden furniture. Bike store. Private parking for 3 cars. No smoking.. Grange Cottage is a stunning stone cottage converted from two former cow-houses, nestled in the entrance to Harome Grange on a working arable farm. 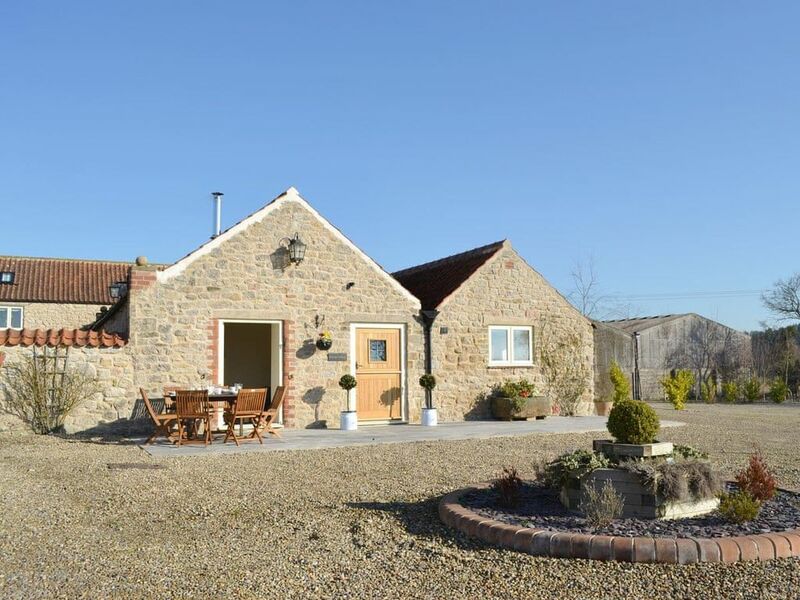 It is only a few minutes’ walk from the Yorkshire village of Harome and 2 miles from Helmsley, on the edge of the North York Moors National Park. This traditional cottage has been renovated to a very good standard, retaining its original beams, the original bull house and feeding window. All of the accommodation is on the ground floor with large, comfortable rooms. The living room is cosy and inviting with a large stone fire place, topped with an oak beam and furnished with a wood burner, ideal for keeping warm on cool evenings. If you wish for a little peace and quiet away from family and friends, you can retire to the small snug to read, or perhaps enjoy a board game or a game of cards. The kitchen/dining room has a stunning, hand crafted, bespoke kitchen, fitted out with all the mod cons. The chefs in the family will really enjoy cooking in here! The master bedroom has a kingsize bed against an impressive feature brick wall, and an en-suite with large walk-in shower. Two further large bedrooms have zip and link beds to provide the maximum flexibility for twin or double occupancy. The house bathroom has a large corner bath with a shower over. Outside this lovely cottage is a stone patio area with seating which is bathed in sunlight for much of the day, and is the perfect location to enjoy breakfast in the great outdoors or an evening of al fresco dining. Across from the cottage is a large garden, ideal for children to run around and let off steam. In the nearby village of Harome is a Michelin star pub/restaurant with its thatched roof and wonky walls. A visit is well worth it even if just for a quick drink after a long day exploring the North York Moors. Grange Cottage is ideally located to enjoy the historic city of York and its world renowned attractions, along with Helmsley which is famous for its beautiful market square, ancient castle and unique shopping experience, and of course the stately home of the Feversham family, Duncombe Park. Beach 29 miles. Award-winning farm shop ½ mile, pub and restaurant ¾ miles.